Face Off (フェイスオフ, lit. 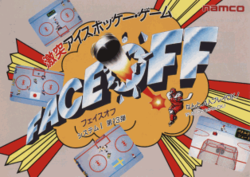 Feisu Ofu), is a hockey arcade game, that was released by Namco in 1988, only in Japan; it runs upon the company's System 1 hardware, and was the first game from Namco to allow up to four players to play simultaneously on the same cabinet (Final Lap, which was released in the previous year, allowed up to four players to play simultaneously when two 2-player cabinets were linked together). It features eight teams hailing from the then-current Soviet Union, Canada, Sweden, the then-current Czechoslovakia, the United States, Finland, France, and of course the game's home country of Japan (written as Kanji Nihon 日本 on the team selection screen as opposed to Katakana). This page was last edited on 5 November 2013, at 18:00.